This lesson can be used as a pre-lesson for the Punctuation & ProsodyLesson plan. Students will be able to read aloud with prosody. Students will be able to read a grade appropriate fictional text fluently with punctuation using graphic organizers and sentence stems. Ask students to define Punctuation. Write examples on the board and briefly review when each are used. Discuss how each form of punctuation affects the patterns of speaking, such as pauses and voice changes. For example: "When you use a question mark, notice how your voice goes UpAt the end of the sentence." 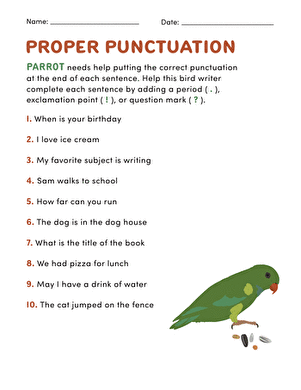 Tell students that they'll learn how to use punctuation as clues for reading aloud, and ask if they can tell how your voice changes along with the meaning of the sentence when you read aloud using different punctuation. Present the vocabulary terms from the glossary and vocabulary cards. Use the visuals as you define each word and allow students to discuss how the visual relates to the new word. 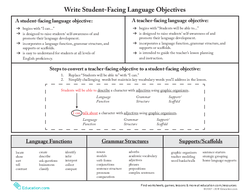 Complete a Frayer Model with the students for Prosody, and check their comprehension throughout by asking them to orally repeat the definition or provide examples. 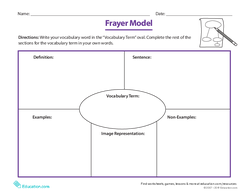 Divide students into seven groups, and have each group complete a Frayer Model for an assigned vocabulary word. Allow students to create and share aloud their own sentences with the new vocabulary words. For example: "I use question marks to show I need an answer to something." Ask student volunteers to come up to the projector/smart board and circle the punctuation in their sentences from the Frayer models. Then, have them share their sentences from the completed Frayer Models aloud with prosody. 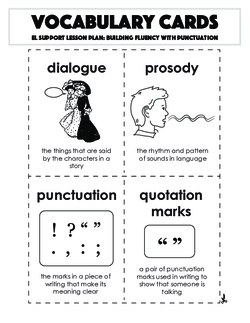 Distribute the Punctuate the Story: The Lost Kitten worksheet to students. Project your copy. Model adding punctuation to the story for two sentences. Ask student volunteers to help you continue adding punctuation marks for another 1–2 more sentences. Have students work in partnerships to complete the punctuation for all the sentences. Review the correct punctuation for the worksheet as a class, adding it to your projected copy. Keep your copy projected, and tell students they will now practise reading aloud with prosody. Ask students to work in partnerships to read every other sentence with their best prosody. Remind them to pause at commas, add quotation marks when a character is talking, etc. Provide students with definitions in both English and their home language (L1) if they are literate in their home language. Allow beginning EL students to form a small group that works with you. Encourage students to write their own sentences and read them aloud with prosody. Get the attention of the whole class, and ask your students to show you their level of understanding of prosody. Have students hold up one finger if they are still unsure and need more information. Students who feel they have mastered the concept would hold up five fingers, and so on. Circulate the room during partner work time, informally assessing prosody. 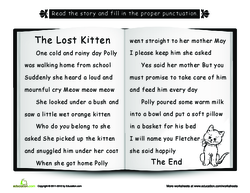 Collect the Punctuate the Story: The Lost Kitten worksheets to review for accuracy. Student fluency should be noted for future small group work. Punctuation helps me read by ____. My favorite part of the lesson was ____. 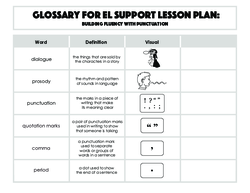 This lesson focuses on how punctuation affects reading fluency and comprehension using graphic organizers and sentence stems. Practise punctuation with a classic Aesop's fable! Your child will add in the missing quotation marks, all while building her reading skills. 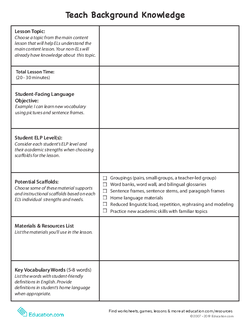 Use this handy fluency checklist to help your students track their accuracy, expression, and pacing when reading to support comprehension! Put your second grader's punctuation skills to the test and challenge her to correct the story by adding all of the missing punctuation marks. Your child can practise her ending punctuation marks with this worksheet. Introduce your child to a classic Aesop's fable with this punctuation worksheet! She'll get to build reading skills while she adds in the missing punctuation. Enjoy one of Aesop's classic fables with this punctuation worksheet. Your child will add in the missing periods and quotation marks.